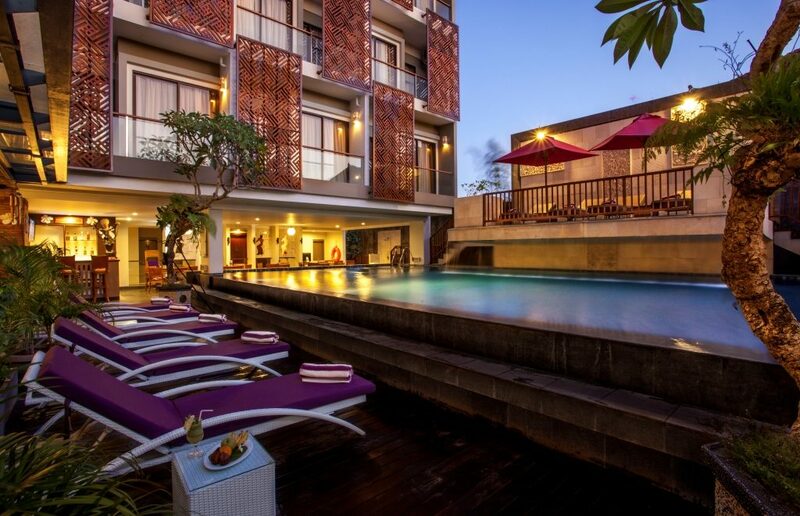 Seminyak Hotel – Seminyak is a tourism area that is located in the north of Legian, Bali. Seminyak is well known as a place to get some private villas from the luxurious villas and hotels up to the cheap one. Besides that, Seminyak is also a place where the people can find the international standard restaurant and world class restaurant as well. In the other words we can say that Seminyak gives the complete features. Seminyak gives the different atmosphere than the other tourism resorts in Bali, such as Kuta. Kuta is well known with a casual and chill atmosphere, while Seminyak gives modern and formal impression. That is why; we can find many luxurious seminyak Hotel here. The tourism places at Seminyak have beautiful white sand like the other tourism resorts at Legian. The difference is that the beaches that we can find in Seminyak are quieter than the other beaches in Bali. Besides that, these beaches are calmer as well. Besides the beach tour, Seminyak is perfect for you that loves to do some activities such shopping, spa, fine dining and night life. Some of these activities are even can be founded on Seminyak Hotel. It is because Seminyak is the center of a high end living such as the high end Boutique, high end restaurant and SPA. Some people say that Seminyak has a really fast development. It can be seen from many development properties such as the Seminyak Hotel. Actually, what we see in the present Seminyak is really different with Seminyak in some years ago. It will be interesting to know about the old Seminyak and knowing about the differences between the old Seminyak and the present Seminyak. 15 years ago, Seminyak is only a small village that cannot have a good development than the other places in Bali such as Kuta and Legian. We can assume that in that time, the promotion aspect for some tourism resorts in Seminyak is not running really well and maybe it is not becoming a focal attention of the local government. We even cannot see a Seminyak Hotel in that time. In the past, rice fields are the common view that the people can see in Seminyak. However, now Seminyak is already changed to a high density public area with many private villas and Seminyak Hotel. This is now a dreamed place to stay in Bali. Some of you are maybe questioning, what is the interesting thing in Seminyak? Yes we can see that the Seminyak Hotel is more expensive than the other hotels on the other areas in Bali, sometimes there is a traffic jam in Seminyak, price of the food is expensive, so why you should visit Seminyak and stay here? Why don’t you just stay in Kuta? Seminyak offers the totally different holiday atmosphere than Kuta or maybe Legian. We know that Kuta and Legian are loved by the travelers, especially for them that find the night live atmosphere. Besides that, the Hotel in Kuta is much cheaper than Seminyak Hotel and the food is more affordable as well. Many people love the tourism resorts in Seminyak because it gives more privacy. Seminyak is the perfect place for them that look for the Seminyak Hotel that offers more privacy. Besides that, the shopping place in Seminyak offers some high class, unique and varied products, five stars restaurants, SPA treatments and many more best services that also can be gotten from the Seminyak Hotel. In the other words we can say that Seminyak is an elite area in Bali for the local or international tourists. There are so many five stars Seminyak Hotel and restaurants that will give the customers the unforgettable experiences. Besides that, Seminyak is really well known with some luxury private villas that are rent for the travelers. Most of the hotel tour package and villa rental is located in Seminyak, Bali. With all of these luxurious facilities on this area, Seminyak becomes really famous and beat the other tourism resorts. That is why; some local and international celebrities prefer to stay at Seminyak Hotel than the other hotel when they visited Bali. One of the famous celebrities that stay in Seminyak is Paris Hilton. So, it is clear that Seminyak is an elite areas where you can find so many private villas and Seminyak Hotel that offers only the best services for their customers. The good thing is that you can choose the hotel and villa with some different price range, from the expensive up to cheap one. You can contact your travel agent to get the information or you can search the information of Seminyak Hotel in the internet. So, come to Bali and stay at Seminyak to experience the different side of Bali with luxury and more privacy.